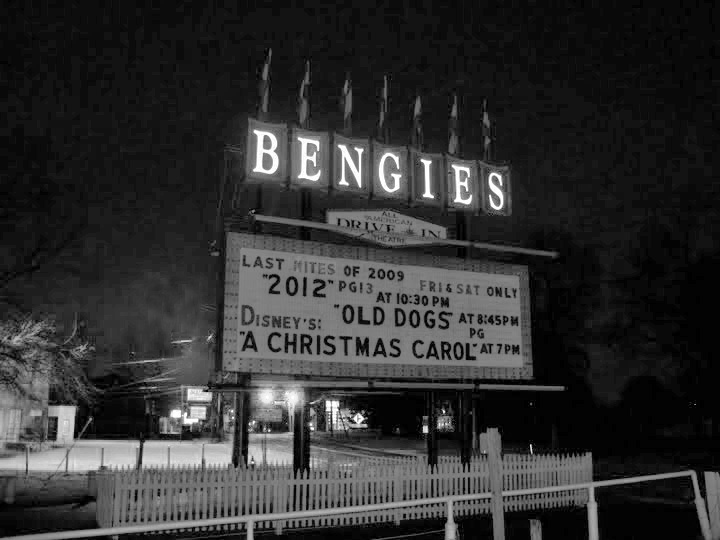 The entrance to Bengies, a drive-in movie theater in Baltimore, Maryland that has been around since 1956. Bengie’s is located right outside Baltimore and recreates the experience of a Drive-in movie theater from the fifties era with authentic intermission skits and an original setting. This movie theater has been around since 1956 yet has been modernized with the huge screen and FM broadcast. I sat in my car with friends, wearing my pajamas, my feet kicked up on the dashboard as I watched the triple feature of new releases. Between movies, after a short intermission skits we took the short walk to the indoor concession stand discovering you could sit and view the movie indoors and buy food that ranged on the menu from corn dogs to egg rolls. We opted out on the typical movie popcorn and our meal included a corn dog, two ice creams, and mozzarella sticks. After returning, the intermission was over and my car began to shake when the earths crust began to deteriorate in 2012, I could hear the depth of the world crashing into the ocean from the drivers seat of my car. After the movies finished up we left passing the row of classic cars on display and then drove back onto Eastern Blvd, Baltimore, the portal back into the 21st century. I saw Kung Fu Panda at Bengie’s and it was fantastic. Three movies for such a low price! So good. Yes! And the food was good. haha. I loved it and want to go back. This is the closest one to us. Can’t wait until it opens back up in the spring!